After a great flight where I cruised past the Zugspitze in fifth place, we had to again land at a “traffic light stop” turn point. Manfred (GER2) knew where he was going, and after changing my mind about the closer shaded launch, I had a rough idea of his intended destination from checking Google Satellite view. I fell into step with Pal (HUN) who was given dodgy directions by a local, and then we broke off through the fields. Later on Pal opted for the road while I defiantly bashed on through the stinging nettle and up through untracked forest until I heard Tarquin (race media) nearby on the track. In the end we all reached the launch close together… Ferdy (NED) turned up as well. I started off flying with Ferdy and Pal but never really felt “with it” and it seemed like we were bumbling around. I decided I’d push off on my own. Later in the Oetztal I pushed along the valley while the others got high in the mountains and overtook me. With the valley wind pushing me I could keep moving along, but I risked getting too low and landing early while there was easy miles to be made. In the end I ended up in a similar position. Half an hour after I landed Stani (CZE) turned up. 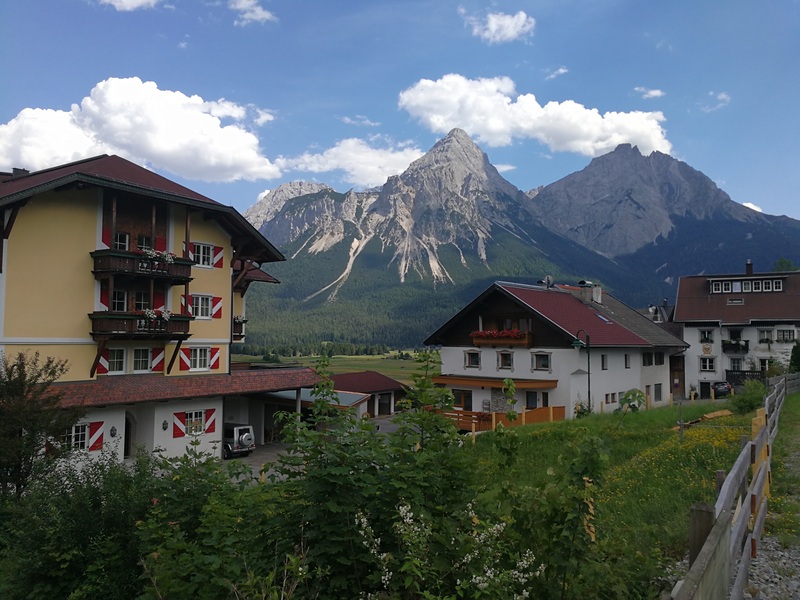 He’d arrived at the Zugspitze several hours later than us after a very difficult flight. 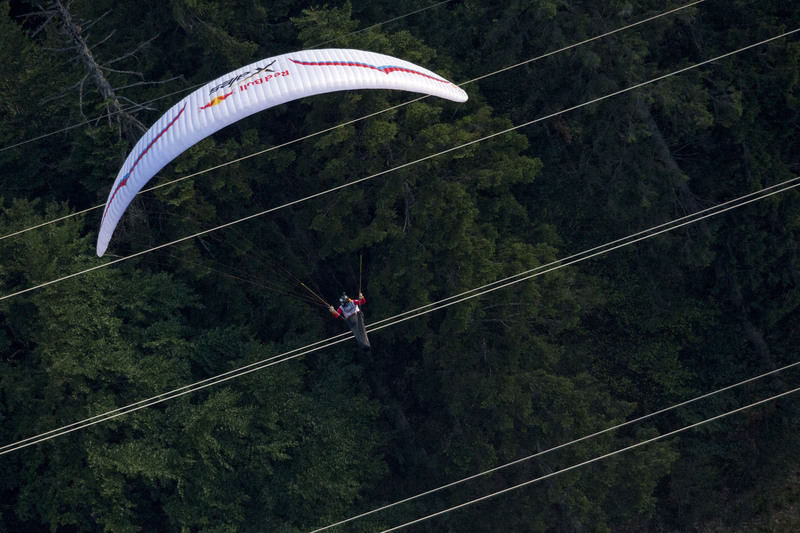 In his favour though he said he was able to simply bunch up his glider and walk a few minutes up the slope before soaring away, saving him the long bash along the valley. He said the evening flight was a gift. His supporter van was stuck on the wrong side of the Timmelsjoch though, a toll road open only during the day. It was the first time I’d seen him since day 2 when his supporter helped me launch. My supporters repaid the favour by making him (and me) a burger for dinner. 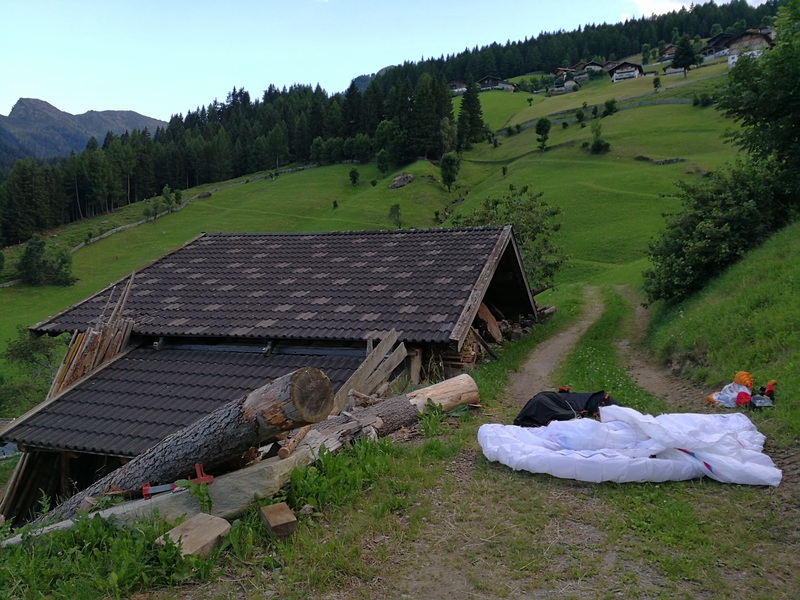 Mum and Ben had a look for a nearby guesthouse but I was quite happy to sleep in the tent. Next morning was a gentleman’s start, Stani was camped up the road as his reserve supporter vehicle (a car) had managed to sneak through the toll the previous night. We headed up for the Matatzspitze, where I was soon joined by a merry crew. Pascal (AUT3) the gentleman helped me fix one of my broken brake lines. Things were looking promising but later some mid level cloud drifted across and shaded things up on our hill. The live tracking showed Benoit, a dozen or so kilometres ahead, following thermals southward. 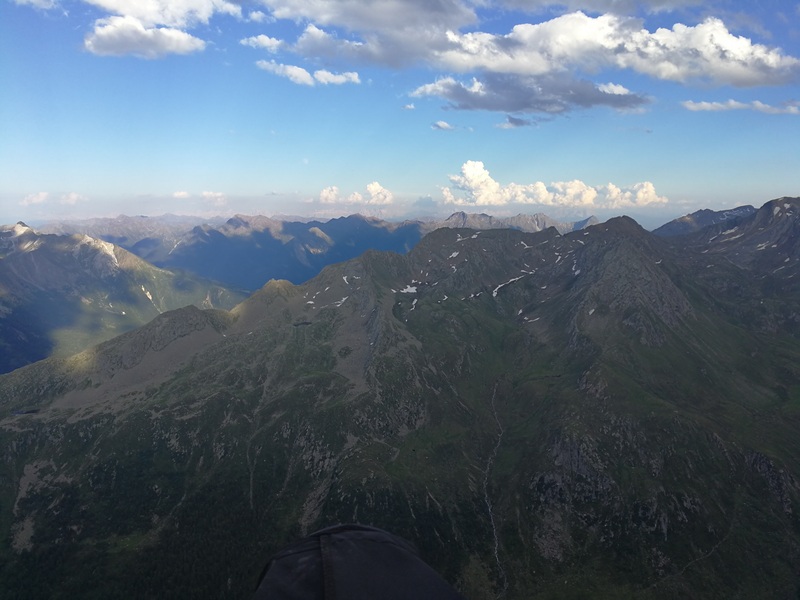 I’d had enough of waiting by now so I took off without waiting for the others, landing on a spur some way down the valley where I had to land, empty my ballast, and climb a little to try and fly back up again. I managed but again I’d taken more risk. A slow learner, as soon as I caught the others I went off again on a different route and again got low… and so the pattern went on. Finally my luck ran out when I made a poor route choice and got flushed by a valley wind. After trying a short miracle flight to no avail I had to face a 1000m climb on foot. The extra bit of exercise is one thing but the real pain is losing valuable time. Luckily the others were delayed by overdevelopment, the Italian afternoon storms. They landed and waited high, but still crept ahead while I laboured. Finally reaching a high ridge I flew but had to land in a hurry in a sink cycle. Conditions kept me guessing but finally afforded me a short thermic flight where I could make some ground to the south. The day was almost done and I had to rush to get the last breath of wind up the face after following a track on foot around a hill that I’d been unable to cross in the air. My launch was a foot too close to a sign and my wingtip line snagged. Of course there was a much better starting place only a minutes walk away! Airborne at last the cloud I hoped might lift me over the Brenta offered nothing but a sprinkle of fat raindrops. Across the valley was a forested ridge with two clearings. I spurned the first one to gamble away another 500 metres of height, and took the second one a short time after the helicopter took some shots. By the time I’d packed up a friendly bunch of Italian emergency services personnel had found their way to my landing spot, where I’d just been talking to a crazy Italian fellow for way to long considering there was no comprehension between us to speak of. I final huff and puff up through the forest and I was very glad that my supporters managed to find their way up a quiet road to meet me at the top. They’d had a relaxing day at the local library (although being locked out of the carpark was possibly not so relaxing..!) 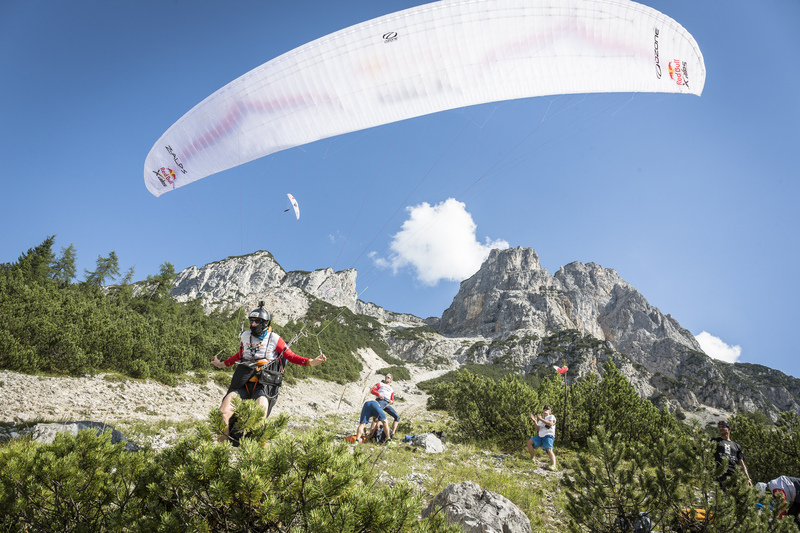 Again I found myself in a familiar place, the next day I would fly the same Brenta cliffs as in the 2015 edition – not such a bad thing, as I missed the lost video footage dearly! looks like someone’s come through here before..
and having all the others catch up. You mean all that I did yesterday counted for nothing? most of the day, weren’t you?